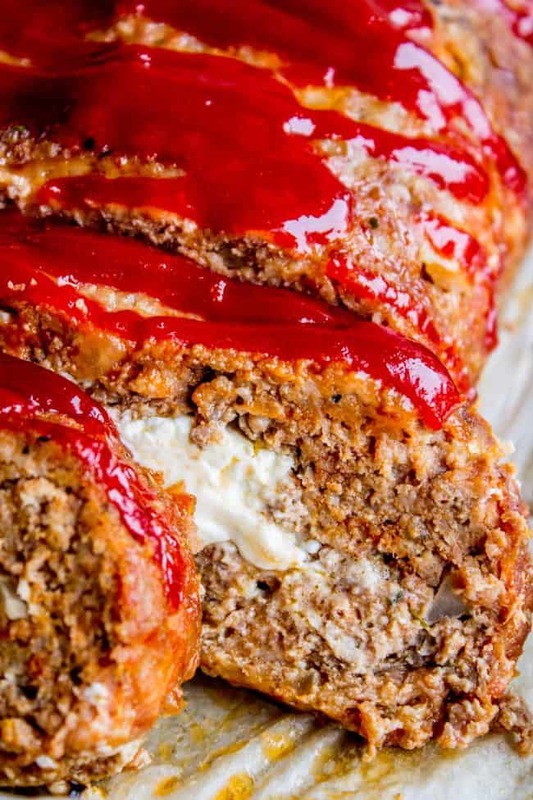 This Cream Cheese Stuffed Meatloaf is moist and tender and, oh yeah… STUFFED WITH CREAM CHEESE. Is anybody gonna turn down a delicious cheesy meatloaf? Stuffed meatloaf > regular dry meatloaf. We took the kids camping this weekend and no one died! It’s a miracle! Then we get home, and as we are unpacking, our neighbor Emile comes over to bring us some Easter treats. (Seriously, we have the best neighbors.) Emile is from Armenia. He’s eyeing all our gear with this bemused look on his face, and says, “So you did all this outside, huh?” and I smiled, so proud. That’s when he told me that he used to be a shepherd for his grandfather back in Armenia. He would leave at 6 in the morning, take 300 sheep out to pasture, walk 20 miles in one day, and be home by 9pm. He told us about how one time, two WOLVES came to attack the sheep, and his little dog (“small, but very brave”) faced them down until they left. Kind of puts it in perspective, right?? We totally cheated because we kind of were only halfway camping: we stayed in a cabin. A bare bones cabin, to be sure (no bathroom, no kitchen, just a room with space to put our own bedding) but it did have a heater and lights. Camping is SO much more fun when you are not being woken up in the middle of the night by a freezing cold 1 year old baby who doesn’t know how to keep blankets on! I made this Cream Cheese Stuffed Meatloaf before we left. It is SO GOOD!! I’m in love. A friend of mine told me she was making cream cheese stuffed meatloaf in passing last summer, and I’ve been obsessed with the idea ever since. I finally got around to trying out a recipe, and I’m so happy with how it turned out! 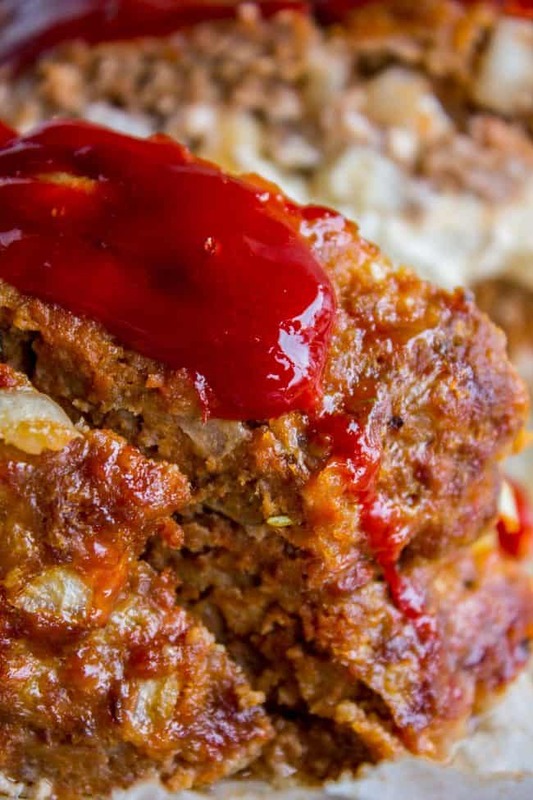 Is there anything worse than dry meatloaf? (Maybe being attacked by wolves??) It’s like actual cardboard in your mouth though, right? There’s no chance of that here, even if you over bake it. The cream cheese is all melty and glorious in the center. I kept the recipe pretty basic so that the cream cheese would have a chance to shine. 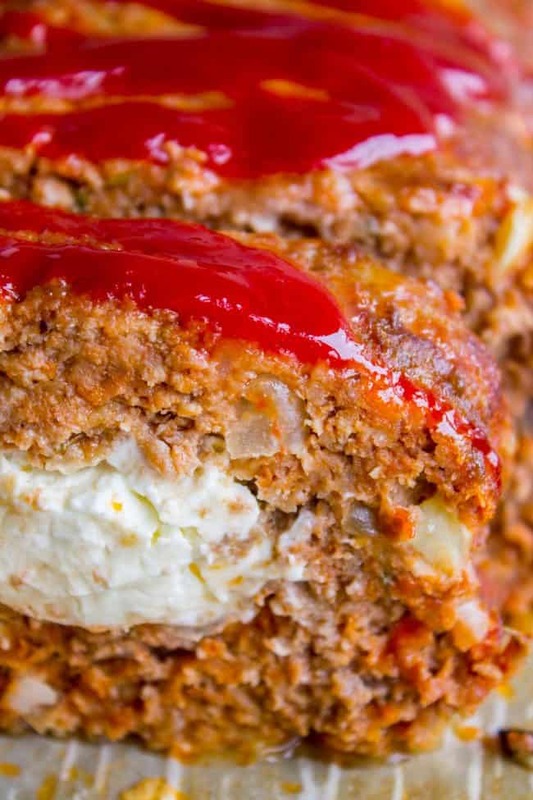 I’m usually not a ketchup girl, but I am totally feeling it with this cheesy meatloaf! It adds the perfect tang that pairs wonderfully with the cream cheese. 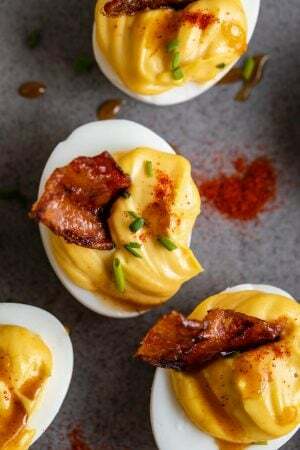 This recipe is totally EASY, too. I threw the ingredients together in 10 minutes, then bake and you’re done. I served this with these Creamy Italian Mashed Potatoes. Heaven!! Is anybody gonna turn down a good meatloaf? I mean come on, it's a classic! 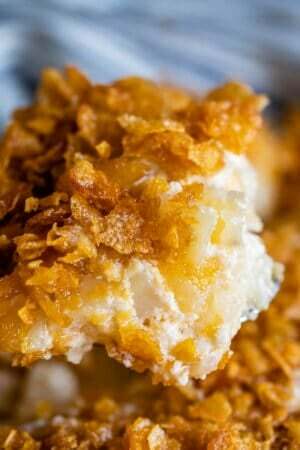 This one is moist and tender and STUFFED WITH CREAM CHEESE. Oh yeah. Stuffed meatloaf > regular dry meatloaf. Preheat your oven to 350 degrees F. Prepare a large rimmed baking sheet with parchment paper (or use aluminum foil and then spray with nonstick spray). In a large bowl, add all ingredients except the cream cheese and the ketchup. Use a knife to cut the cream cheese into large chunks (see photos). Set aside. Use your hands to combine everything together. I know, I know. But it really is the best way, a spoon doesn't do the trick as well. Don't over mix! Once you have everything thoroughly combined, stop. 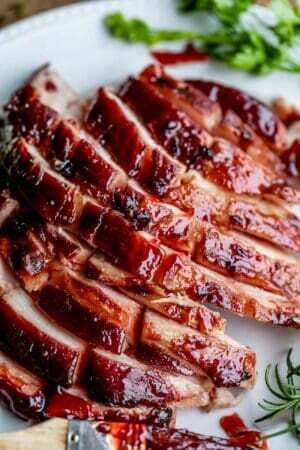 Turn the meat out onto the prepared pan. Pat the mixture down into a large rectangle. 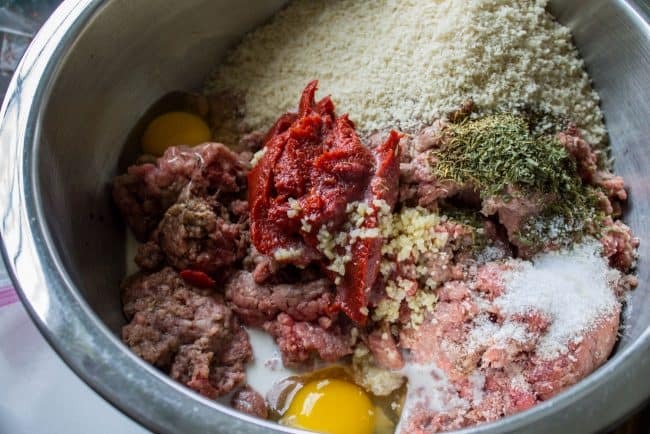 Add the chopped cream cheese down the center of the meatloaf (the long way). Use your hands to carefully fold each long end of the meatloaf on top of the cream cheese. Seal the edges by molding it together. See photos. 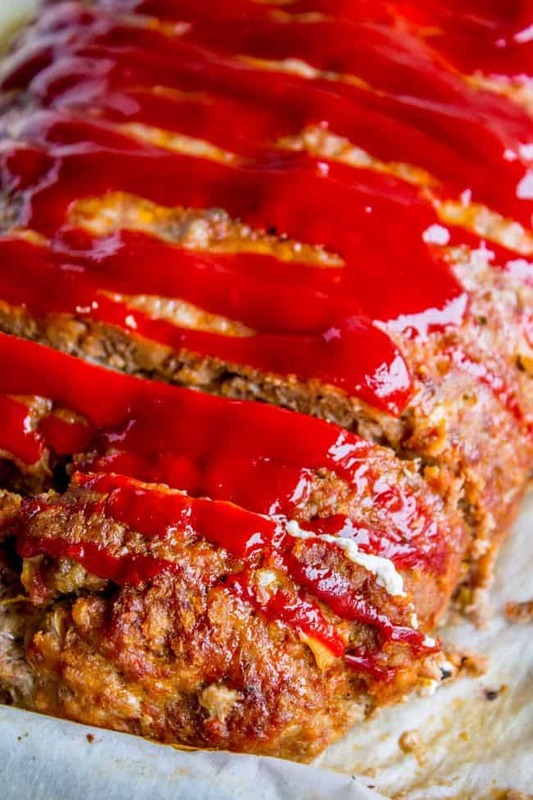 Add ketchup to the top of the meatloaf. I actually didn't measure this part, just squirted it on until it looked good. Bake at 350 for about 40-50 minutes, or until a meat thermometer reads 160 degrees F.
Remove from the oven and wait about 5-10 minutes before slicing and serving. Enjoy! 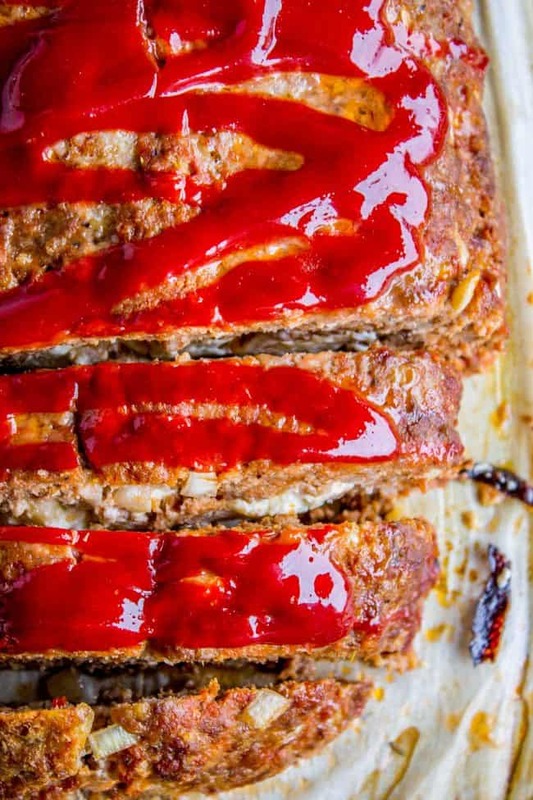 You can easily make this meatloaf ahead of time. Just shape the meatloaf and then cover and refrigerate for up to 24 hours. Then bake as directed. It might take a few minutes longer to bake, but it shouldn't be too much longer. 1770 House Meatloaf << this is one of my favorite comfort foods! A classic from Ina Garten. 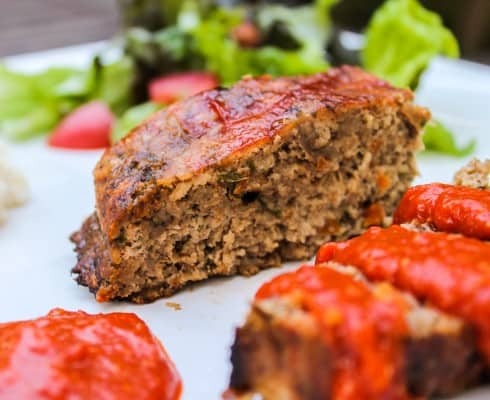 Turkey Meatloaf with Roasted Red Pepper Sauce << this is an oldie but a goodie! 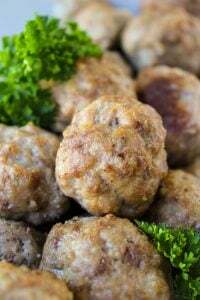 Easy Baked Meatballs << this is a good basic recipe. I love myself when I have a stash of these in the freezer. 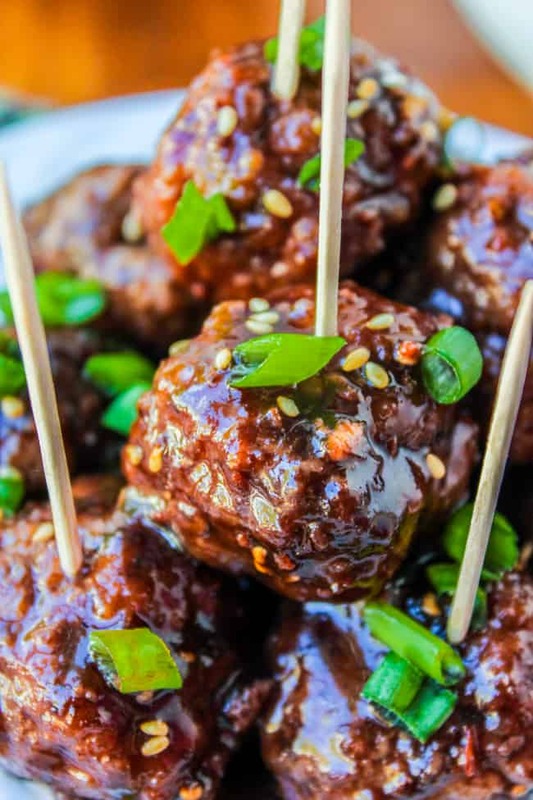 Raspberry Balsamic Meatballs (Slow Cooker) << these are good for an appetizer or dinner! 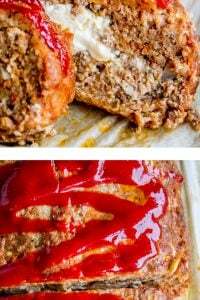 Other Stuffed Meatloaf recipes you will love! This is so delicious. I will never try another meatloaf recipe. My husband and kids were fighting over the leftovers. Hooray! I mean for loving the recipe, not for the fighting ;) Cream cheese really does just make everything better. Thanks for coming back to review Dulce! This is my personal favorite. Meatloaf brings back really good memories as my grandmother makes really delicious ones. I would love to try this recipe. Looks so easy. Thank you for sharing! Haha your posts always crack me up!! And yeah, I agree, dry meatloaf is not cool at all. This looks awesome. Hi Karen, being British I’ve never made meatloaf! 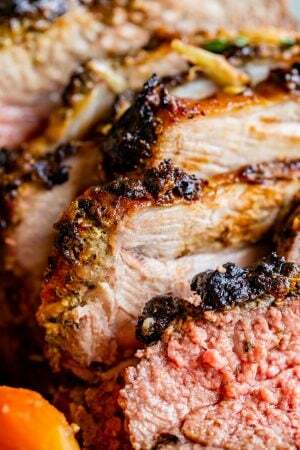 So I’m going to try this, but can I halve the recipe? How long should I cook it for if the answer is yes? Hey Annie! Never tried meatloaf! It’s time for sure! I think this would work fine if you halved it. I would guess it would take about the same amount of time to cook actually, but start checking with a meat thermometer around the 30 minute mark just to be sure. Let me know how you like your first meatloaf! So exciting! 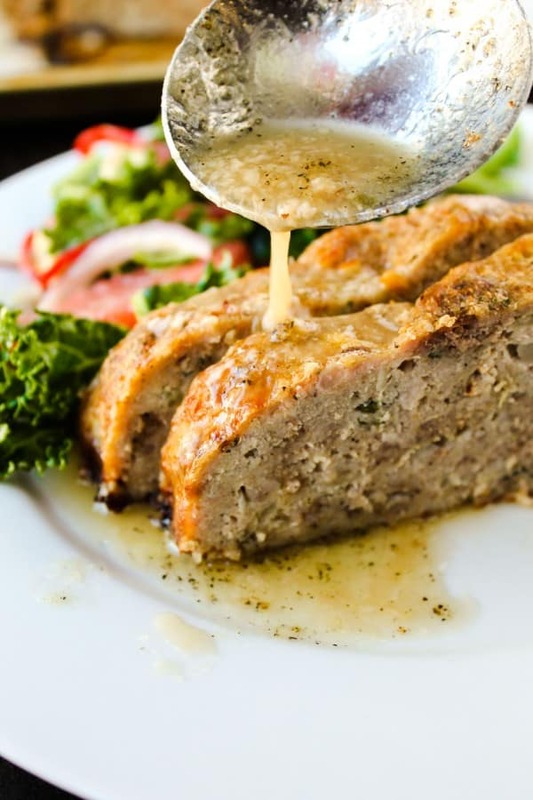 Great idea for keeping the meatloaf moist–I will try it this weekend! 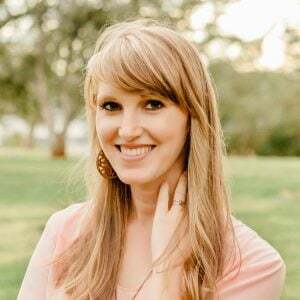 And, I have always wondered where Jolly Ranchers got their name…I am a rancher, and there are times of the year that I am jolly, but it has nothing to do with candy!! Spring is my favorite time of year, but Mother Nature is giving us an extended winter. Today we woke to 12 degrees. The cows are doing well in it, but I am dang cold and not very jolly as we get ready to feed them!! It’s so true, I had never really thought about the name Jolly Ranchers until I wrote it down last night! I would not be jolly either if it were 12 degrees outside. No thank you!! Stay warm out there Debbie, and thanks for stopping by!